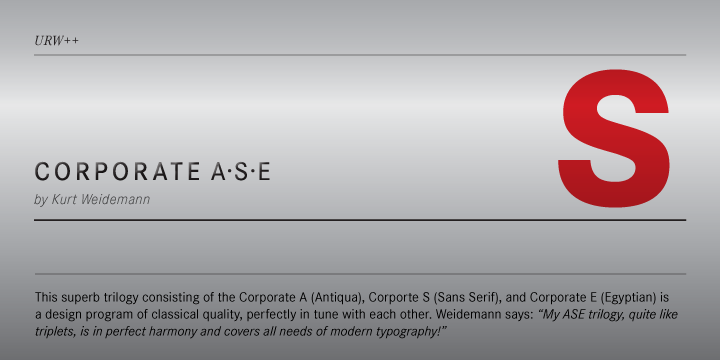 The Corporate S Std (ASE typeface trilogy) was initially designed by Prof. Kurt Weidemann, a renowned German designer and typographer. The project was undertaken right from the year 1985 until 1990. This was considered as a splendid trilogy comprising of the Corporate A (Antiqua), Corporate S (Sans Serif), and Corporate E (Egyptian). It is actually a beautiful design program of standard quality, flawlessly in tune with each other. The typeface is available in regular, bold, italic, and bold italic. Today, it is available in the WGL 4 character complement.